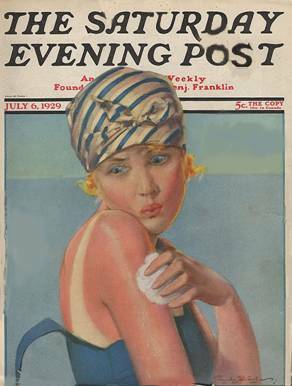 Investment Flash: Ah, The Summer of 1929! This year, Victoria Beckham, Hollywood’s new ‘it’ girl (pictured below), has a style reminiscent of the overly tan short-haired woman from the summer of 1929. Late last year, she and pop singer Rihanna returned to the ‘bob’ hairstyle, made famous in the 1920s. It is now fashionable in the U.S. and U.K. The ‘bob’ also appeared in the early 1960’s in the final stages of that boom after being reintroduced by a young hairstylist named Vidal Sassoon. As shown in our latest (subscribers-only) Investment Analysis Report: Credit Downturn Force Feeds Wall Street Banks With Losses, the credit crunch that we have been warning about has begun. Bloomberg News recently produced a video that provides sobering commentary on the outlook of the credit market. As the credit crunch spreads, forced selling and unwinding of leverage on assets will occur. Only Yesterday: An Informal History of the 1920’s by Fredrick Lewis Allen is provided online by the American Studies at the University of Virginia. We highly recommend reading Chapters 11 through 14, which detail the Florida real estate bubble in 1926 and the stock market bubble of 1929.